Pictures! - www.FreeWheelSpa.com The Home of Happy Bicycle Freewheels! Pictures ~ Or it Didn't Happen! 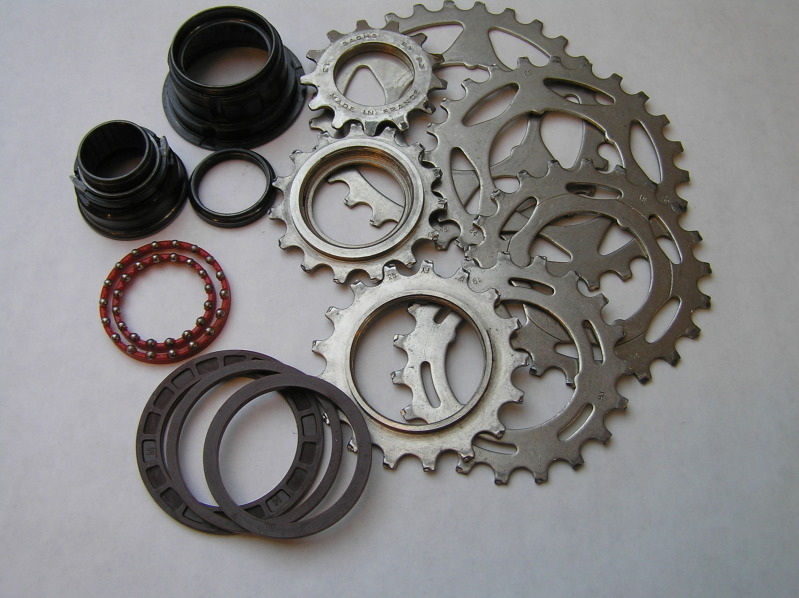 Historic Ritchey Mountain Bike Freewheel Service! 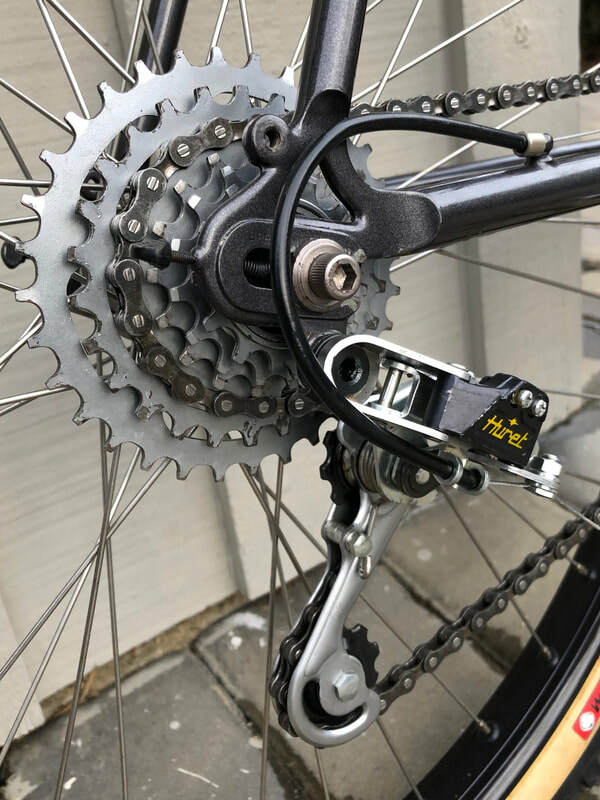 In March 2019 I had the privilege to service the original Suntour New Winner 6 speed freewheel on a very early 1981 Tom Ritchey Mountain Bike, serial number 91. Steve in CA had acquired it from a museum in NC. It had not been ridden in decades and the freewheel was basically locked into a fixed gear. I discovered the adjustable bearing race had been cracked and the inner body not in "round." This probably occurred as a result of seizing on the hub and the force of removal by the two notch tool deformed the circular shape of the body and caused the crack. Internal cleaning, new parts, and fresh synthetic grease brought this historic Ritchey back to tip top riding condition! Recently (February 2017) Martin in Toronto, Ontario contacted me. He owns a vintage Moulton bicycle. 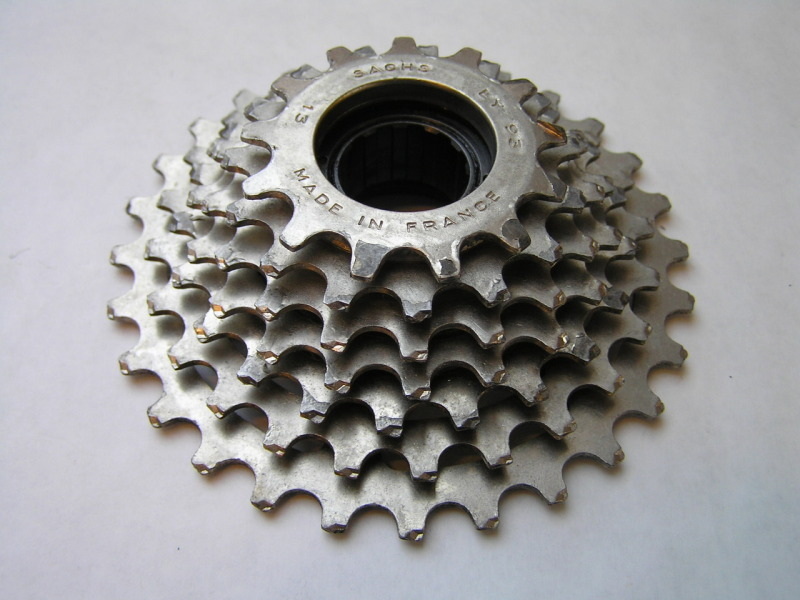 Apparently Moulton made special three-sprocket high geared "blocks" for Regina BX 6 speed freewheels and Suntour Winner and New Winner bodies. These blocks carried the smallest sprockets of 9-11-13 teeth. The Regina block turns the 6 speed into a 7 speed and the Suntour block turns the 7 speed into an 8 speed. Martin had the Regina BX and wanted lower gears for his 70+ year old legs. He also was able to secure the Suntour block and wanted to see what I might be able to set up and sell to him (also with low gearing). I was happy to take on this unusual project. ​The finished Regina BX/Moulton custom 7 speed freewheel (above and to the right). 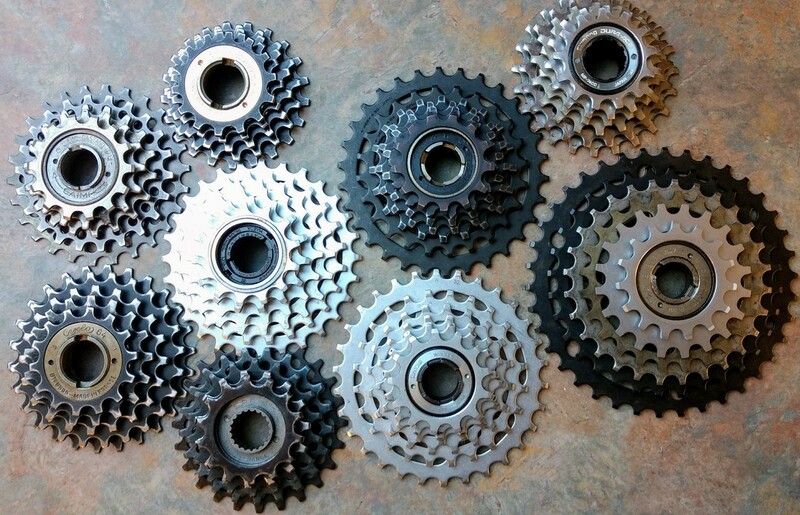 I was able to supply Martin with the 15-19-24-31 tooth Regina sprockets. I also serviced the BX body and cleaned the spare sprockets which were originally mounted. What you see above is the work I accomplished one day in February 2017. In the above picture the following freewheels received service: Caimi (Everest), Cyclo Competition and 64, Shimano Dura Ace, Suntour Accushift, Perfect, New Winner and Winner.